Just Skirts and Dresses: Crochet collar and cuff pattern from 1934! 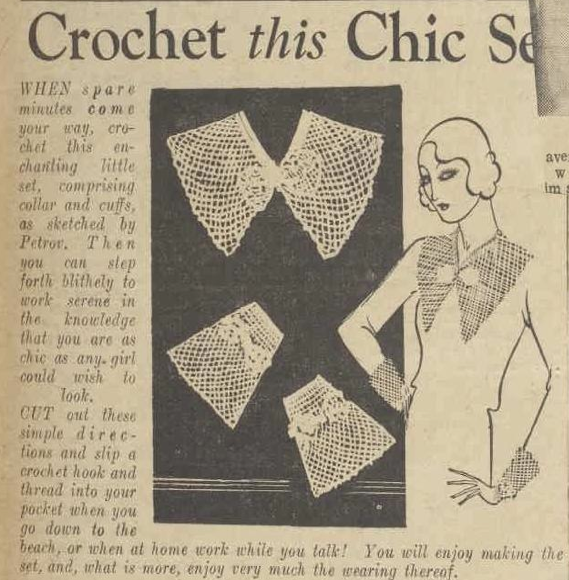 Crochet collar and cuff pattern from 1934! I thought it would be fun to finish the Miss Lemon wardrobe series with a 1930's project, Miss Lemon could make herself! "Here's another of those completely adorable collar and cuff sets that go on and of in the twinkling of an eye so that your best friends never know whether it is the same frock you are wearing so often or not. The set is delightful for a dark frock, and adds that ultra-chic touch of smartness that turns an ordinary dress into a most distinctive one." 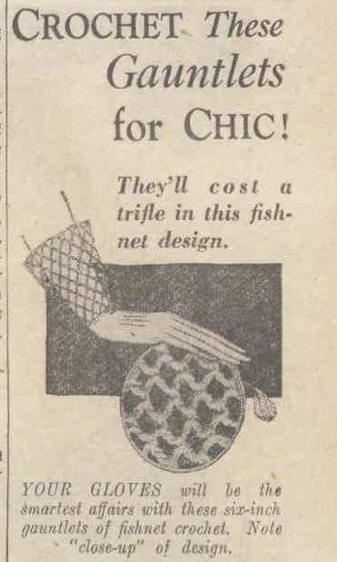 "Here is another of fashion's irresistible little notions that can be worked at almost lightning speed from an ounce of wool and then attached to any pair of gloves to match your daintiest frocks. White fabric gloves with white crochet gauntlets would look so smart with a black and white outfit. And white tops on beige, brown, or grey gloves would be equally effective." 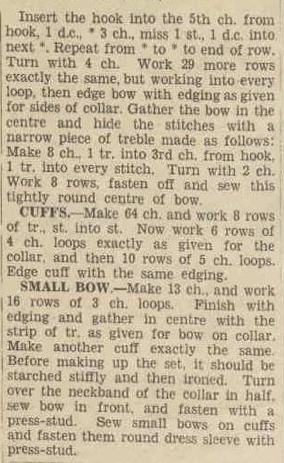 Bows were an 'inseparable' element of the 'Continental' knitted and crocheted designs in 1933-1934. We know Miss Lemon loves matching cuff and collar sets, so let's imagine she took out the crochet needle in the evenings, after a long day in company of her demanding boss, Mr. Poirot! "An enchanting little set, comprising collar and cuffs, as sketched by Petrov*. Then you can step forth blithely to work in the knowledge that you are as chic as any girl could wish to look." * Petrov (also known as Geoffrey Claude Turton) was a cartoonist and magazine illustrator. Petrov regularly contributed to the AWW magazine in the 1930's. The original collar and cuff ensemble was designed to be larger than mine. I wanted to make a contemporary version which could be worn without appearing 'overdressed'. - I used a metric size 2 crochet needle. - The size of the finished items may vary by the size and weight of the yarn used. I would recommend to start by making the bow of the collar. This goes quite fast and gives a good idea of the sizing! - To make a larger collar add a multiple of 2 chains to the starting row of chains. - If you don't use mercerized cotton yarn you may expect about 5-10% shrinkage! In order to avoid an unusable small sized set you should make the pieces slightly larger: add some length to the desired cuff circumference and collar length. What is Mercer cotton? In 1851, John Mercer (1791-1866) found a way to increase the luster of cotton by adding caustic soda, sulfuric acid and other chemicals to the fiber. By altering the cotton, it was found that it didn't shrink as much when washed and took dye more readily. Mercerized cotton is also more mildew resistant than standard cotton fiber and has a softer appearance and feel. For both the collar and the cuffs less chain rows were made (collar 12 rows, cuff 11) The original 18 and 16 rows seemed a bit overwhelming, I felt less rows would give a nice balance for the bows. My bows are made as described in the pattern. For the collar I made 3 rows of 4 ch, 4 rows of 5ch and 3 rows of 6 ch. For the cuffs 6 rows of 4 ch and 5 rows of 5 ch. Size of collar: I increased the chain length of the collar. The 110 chains of the pattern formed a length too short to make a nice v-neck. Picot's: I used slipstitch instead of d.c. to make the picot's, because that's the way I learned it and it makes the work look finer too i.m.o. 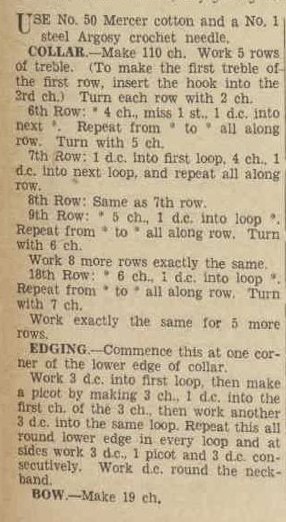 Edging bows: The bows are made with smaller, 3-chain loops, so 2x3 d.c. as described for the collar was way too much. I used 2 d.c.-picot-2 d.c. instead. The crochet terms used in the original pattern are the UK terms. Interestingly, another crochet pattern I found in the AWW used the US terms. Getting confused? I certainly was, but the picture and crocheting a test piece helped. For more explanation of UK and US crochet terms click here. This pattern appeared in an 1934 issue of the Australian Women's Weekly magazine. All original newspaper images through Trove, all other images are mine. - After reading the pattern descriptions I wondered where the press-studs should be placed, where the small bows should be sewn and whether I should finish all of the edges of the cuffs or the sides should be attached first. I guess those days these things were more evident to the readers than now. As far as the edges of the cuffs go, the pattern doesn't mention crocheting round or sewing the sides together (though it seems like there are no visible edges on the picture) so I choose to finish the sides and upper edge with the picot motifs. I attached the bows in the middle of the cuffs, just on the last two rows of the treble stitches. - I didn't used press-studs, planning to handsew the collar and cuffs to the sweater instead. It can be easily removed before washing. - It can be handy to attach the bows separately with small safety pins. That way they can be easily removed, washed and starched again. Besides that the bows can be worn separately as a brooch. "Attach white touches by tacking or fastening by tiny gold safety pins, then they can easly be removed and laundered." - Starching of the finished collar, cuffs and bows before finishing (=assembling bows) is necessary! The lace loops won't stand in place on their own. Iron everything on a thick towel with the right side down to keep the surface structure intact. To see my finished set in action click here!